This is a Holloway brooch. 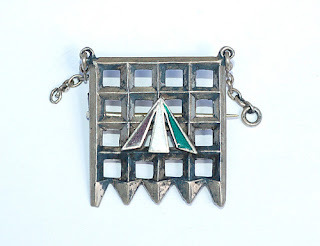 It was designed by Sylvia Pankhurst, the daughter of Emmeline Pankhurst, a leader of the British suffragette movement and the founder of the prominent women’s suffrage organization The Women’s Social and Political Union (WSPU). Read more on the blog - absolutely fascinating! Feel like making something wonderful with wire and pearls? Then - this update is for you! But even if you haven't spent the last week making sketches of pearl encrusted fairy tiaras sculpted of wire - well - we invite you to have a look at these new freshwater pearls to see what they inspire you to do. If your taste runs to the traditional - you'll probably like the Silver Grey round pearls, these Oval cream pearls, or these Natural Mix pearls. If you like a bit more of a modern twist - then these Coin Pearls or these Light Bronze pearls are really pretty and make very elegant necklaces, earrings, and bracelets! If your taste runs more to the cutting edge of fashion, where every creation is a super-statement of individuality (me! me! me! - my inner voice is yelling - ooh - that's me!) - then check out these Storm Ocean Green Stick Pearls or these Ivory Slender Stick Pearls. And, if your taste runs to the Go-Big-or-Go-Home school of thought - check out these 12 mm Moonlight Silver pearls! 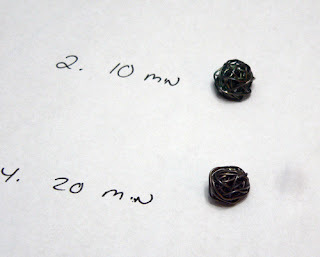 We've also added other gauges of round wire in the Vintage Bronze because it is an excellent match for the Vintaj findings, and in the Gunmetal, again, because it is an excellent match for our gunmetal beads and findings! Update on the Gilders' Paste. Wow - the Gilders' Paste flew out of here so fast, it left multicoloured skid marks! Those of you who were disappointed because it was sold out - good news - it is being restocked (colours as available!) as I write this and will be available online by the time you read this!! Canada Post is back to work! However, they caution us that their normal service standards are not guaranteed and to please anticipate delays for the next week as they get back up to speed. We thank you for your patience! I'm sure many of you know (or have at least heard of) Maria Rypan. Maria was one of our first teachers here at beadFX. She's been extremely active within the Toronto Bead Society - and certainly active within the bead community in general. Mona Hair of The Jewelry Connection has recently completed an online video interview with Maria that you certainly won't want to miss! Marg, our fearless beader and buyer headed off to the recent Bead and Button show early, as she had signed up for some classes in Kumihimo. Kumihimo is Japanese braiding. Traditionally, it is done with a tool called a marudai, which resembles a small stool with a hole in the middle. Nowadays, kumihimo is often done on square or round foam disks with slots around the edge. These are inexpensive and make it easier to learn the sequence of moves required to make a braid. Small differences in the sequence of moves and the starting arrangement of the cords can result in an almost infinite variety of patterns. In particular - these classes introduced beads into the braids, with an end result that Marg says "looks exactly like bead crochet!" Here are some images of her pieces from the classes, and just practicing and experimenting after class. This one shows various types of braids, just using the cord with out the beads. If you want to give Kumihimo a try yourself, there are square disks and round disks - which produce different kinds of braids (you can do flat braids with the square disk and round (in cross section) with the round disk. The bobbins are useful for keeping your threads from getting all tangled up. We have a couple of books on technique, and more coming soon! For cord, you can use a medium weight cord like C-Lon Bead Cord or something more exotic like Satin Rattail Cord or Mousetail. If you are adding beads, Size 6/0 or 8/0 beads will fit on the C-Lon cord. For smaller beads, try the Miyuki Crochet thread or Sono Beading Thread. Last week I talked about making a box out of no flake firing firing foil (click here). I made one to use to fire BronzClay in and this week I managed to test it out! As you can see in the picture to box did blacken after firing but as its name claims the foil did not flake at all. As you can see in the picture below you can rub the box as below and nothing rubs off. To answer the question as how did the items in the box turn out? Well in all truth they did not sinter properly but it is probably due to the type of carbon I used. When I went to buy carbon this week they were out of the coconut carbon I usually use. Alas, I bought the coal carbon which is used for firing regular BRONZCLAY, when I went to fire I reviewed the directions for FAST FIRE BRONZCLAY and noted the they recommend using the coconut carbon. I decided to try it anyway ('cause I like to test these things). Well, you shouldn't use coal carbon, it didn't work. Needless to say this should be a topic for another post, picking the right carbon for you base metal clay. Now I have a research project! Hey, guess what people? It’s my anniversary! I’ve been writing the Business Chat for one year and one week now!!!! WOOOHOOO!!! Last week I gave you a challenge – the One Word Challenge. It’s the start to a series (not necessarily every week) on creating your brand, your story and your USP. As I went to write the second installment I thought, hmmmm…. I think I’ve touched on this subject before. Well yes I have in small bits. Here. I want you to read these before I add more to them. There’s another reason why I was trolling over my previous posts. I have a confession. There’s a secret mission behind this column - I’m gathering material. I will be launching a brand new website soon, very very very soon (this fall). The name is still a secret (because I don’t know it yet) but the concept is Business Thinking for Creative People. As I’ve mentioned in a couple of posts/rants, making work is easy, selling it is work. If you don’t think of yourself as a business you aren’t one and you’ll end up drifting along if you’re lucky or worse, losing money. That is unnecessary. I don’t believe in the starving artist. When I was explaining this to a fellow artist she looked panicked and wailed, “but I don’t know HOW to think business!” I intend to change this. My Business Thinking site will offer informative posts, tips and tricks along with the occasional tough love kick in the pants (we all need that). There will be hard facts, step-by-step tutorials, as well as insights on the creative business scene. Today I want everyone to do a celebratory happy birthday dance for The Business Chat, and then tell me, what are your informational needs? Do you want a step-by-step course on how to set up an online shop? Instructions on setting up your Facebook business page? Learn how to register your business? Help with branding? Pricing? Do you want to meet those people who are running a successful creative business? Need help with craft show displays? Online shop help? What can I do that will help you get to the next stage in your creative business? Just in case you missed the update last night - We added two very exciting new products this week. Gilder's Paste in a variety of colours, and Iridescent Luster Gel. Drying time varies depending on substrate and surface preparation, approximately 10 - 15 minutes to the touch on dry debris free surfaces and 12 hours for complete cure time. If polishing or burnishing is required allow 12 hours drying time. 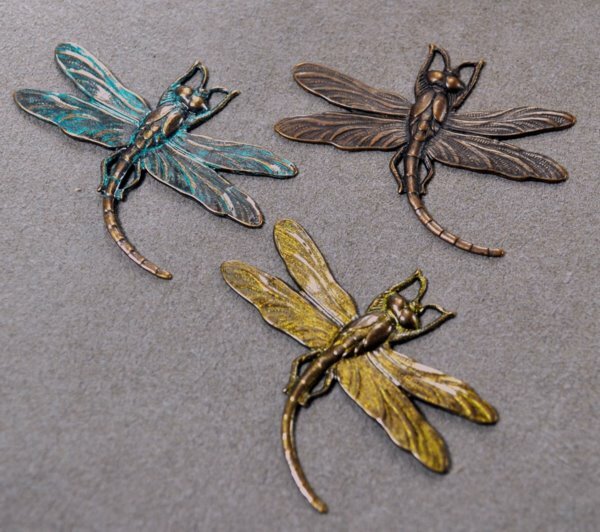 Dwyn made these with some Vintaj dragonflies - Love the colours! The other neat item we added last night is the Iridescent Luster Gel. For those of us who love the gorgeous blues and greens that we can sometimes get from Liver of Sulphur will love this product. It's designed to give those colours, and will go through a range of colours within 30 minutes. (Yellow, Gold, Orange, Red, Brown, Purple, Blue.) I highly recommend you do a couple test batches to see how long you'll need to leave your silver submersed to get the colour you want. I tried two different batches. 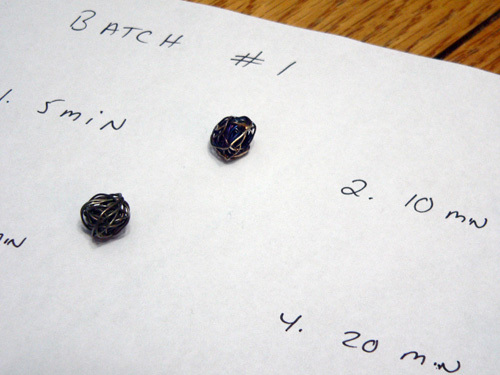 With the first batch, I removed a bead from the solution every 5 minutes. I found I was getting the irridescent patina much faster than I had thought. I ended up taking out two beads at 25 minutes as I didn't think much else would happen at that point. I do apologize for the pictures - the patinas are far more brilliant than what I was able to capture this evening. I have far more photography challenged days than not. 2 - 10 minutes is actually a very nice dark seafoam green colour! 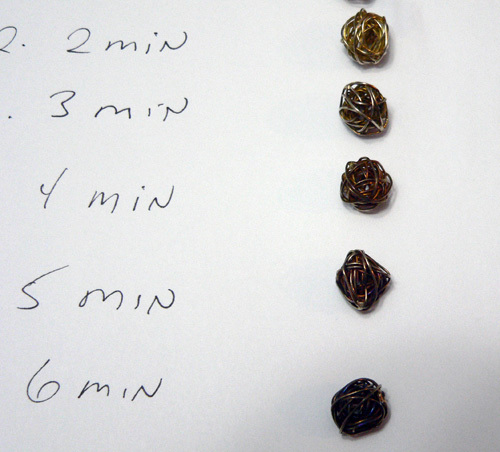 1 - 5 minutes is my favourite, as I can see golds, blues, and purples - all in the one bead. I then did a second batch considerably shortening the exposure time. 6 minutes looks quite dark here, but this is where I started to see the deep blues/purples. I plan to experiment a bit further with some larger metal clay (fine silver pieces). Hopefully, I can get some better pics for you. I do quite like the patina gel though! Tarred and Feathered at beadFX! Well - not tarred actually. Just pasted. New this week is some exciting stuff that isn't ... it's not beads. But it goes with beads. I'd like to introduce you to Gilder's Paste - it is a wax/resin blend with high concentrations of pigment - it is water resistant, and can be buffed to a shine after drying. 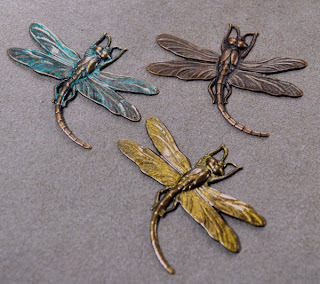 You can use it to add patinas and interesting colour effects to metal, wood, bone, ceramic, etched glass (won't stick to shiny glass), polymer clay, epoxy clay, resin, wax candles, dried gourds, carved foam, and whatever else you can think of. It comes in a delicious range of colours - and a little goes a very long way - a tin of this is going to last you forever. Oh, and before you give me a hard time about the spelling - it is Gilder's as in gild - meaning adding a metallic layer, not guild as in a group of people with a common goal. "Dip your fine or sterling silver or silver plated items and wait for the colour change. When you get the colour you like, pull it out, rinse and let dry. You can seal with Renaissance wax or a clear coat for a more durable finish. Colour change over the course of 30 mins is: Yellow, Gold, Orange, Red, Brown, Purple, Blue." Woohoo! I have got to try this! Feathers are hot - which means they are cool! Feathers are popping up in jewelry everywhere, and I have to admit - these feathers are very luxe. Richly coloured, soft and glossy - I am smitten! It's going to be earring-city for me - I am going to indulge in long, and lightweight! feathery earrings! Perfect for summer! It's a mystery! Secret stuff in our mystery bag. We can't tell you what is in it - but we can say that the retail value is somewhere between $8.00 and $20.00! Enjoy! Happy Hour Torching a big hit on Mondays! Happy Hour Torching last Monday was a smashing success - so if you've been unable to make it out on Thursday - come out and torch with us on Monday! Happy Hour Torching is now both Monday and Thursday evenings, from 5 - 9 p.m. Happy Hour Torching is our lampwork studio evening two-hours-for-the-price-of-one event. From 5 pm to 9 pm, Torch for two hours for the price of one. The other day, quite by accident, I ran across an image of an antique (circa 1842) beaded German songbook. While I would love to have a peek at it in person - the $1300 price tag is a bit out of my reach. Of course, I'm now quite obsessed with finding other beaded books. As you can imagine trying to google "beaded book" is impossible. I've tried all kinds of variations including being specific about the binding being beaded, not a book about beads ;-) Still no luck. I did however come across a beading journal project that seems to have ended last year. You can still view the project and gallery online, and there are some fabulous examples of bead embroidery journal pages done by contemporary artists. Be sure to check out the Bead Journal Project - Wonderful beady eye candy! Our July schedule is out and on our website. See what's coming up in the month of July. I've been doing some cleaning and sorting and tidying - and I found a box of beads. Ok, no surprise there. Instore, we have little packages of random bead mixes called "Auntie Gwen's Bead Soup." These are made up from odds and ends and left-overs from packaging. You get some really good stuff in there. It used to be that the person that put these little bags of goodies together was me. I had a box of bags and labels and a scoop and I would sit at the dining room table, sometimes assisted by friends, and we would make mixes and bag beads and chat. I no longer have time for this little task, and it has passed out of my hands and into the capable hands of others. However, much to my surprise, I uncovered a very large box, filled with beads, dating back from when I used to be in charge of this. So I schlepped it back to the store - "Look what I found!" "Oh fabulous," cried Rosemary, positively pouncing on it, "We need more beads for the 'Auntie Gwens.'" Next thing you know, Rosemary and Marg and I are sifting through the beads - "Oooo - look at those!" "Wow - we haven't had these in a while!" "Omigawd, I loved these." And I thought - here we are, between us, we probably have at least 30 years experience with beads of all kinds, and we still get excited about it. How cool is that? Yay, I have my No Flake Foil that I ordered to create firing box for base metal clays and today, I am going to make it into a box. What is No Flake Foil and why would I use it. Last month I blogged about ways to contain carbon for firing, the steel pan I use for firing leaves a black dust in my kiln which is messy!!!! So I am attempting a less messy solution with this foil. It is like very thick like aluminum foil and it is supposed to not flake (as in the name). I had my own idea in my head on how to make my box but decided to surf the web for other ideas. Good Ole Cool Tools has published a video on YOU TUBE - showing each step. It is a well made box. All I used was a ruler and scissors. I cut the foil to be 12 inches by 12 inches. I folded three inches for each side into the middle. I opened up two sides and folded each corner in a triangle (please see photo). Voila, this is clearly not a pretty but not bad for a first try. Obviously the Cool Tools example is better finished but I wanted to make a bigger box without `wasting any foil`. This is definitely not as pretty as Cool Tools but, it will serve its purpose. It is a bit larger which I hope will allow me to load a bit more stuff in there!!! I will not make a lid. I have found that a tight lid affects my firings. I think I will lay a few strips of foil on top. Now I need some fresh carbon and test this baby out!!!. I will let you know the results. This weeks topic was supposed to be Business Registration, however I’ve decided to put that off for a bit because something happened at my craft show last weekend that I think is far more important. Three fellow vendors asked me to critique their booth. Each of these vendors is relatively new to the show scene (less than 4 years) and each had been in business for a couple of years (2 – 6 years). All were wondering why their sales weren’t higher, why it was so difficult to get people to stop, why people just kept walking past. If you are a crafter who doesn’t do, or isn’t planning to do, craft shows do not stop reading here. This is about attracting customers be they in the retail world, online, or wholesale buyers. Put on your customer hat for a minute and think of the aisle at your craft show. (Or the online marketplace you are in). Why would someone stop at your booth? What are you doing to attract customers? To attract customers you have to stand out from the crowd. Standing out means having a clear brand. It means having a story. It means having a message. It means having a Unique Selling Proposition (USP, we’ll be getting to this later). Creating a brand, a story and your own USP is a long and daunting process that is going to take us some time to get into. A brand is about creating customer expectations and placing a mental image into a customers mind. When I say the word “Tiffany” what do you think of? How about “Nike”? Now say your own company name, what do you see in your mind? If you don’t have a nice clear image you can bet that your customers doesn’t either. So I want to begin this series with one simple exercise. It’s the One Word Challenge. I want you to decide on One Word that you want to own. This is a word that you keep in mind when you make your work, when you design your marketing materials, when you build your booth, when you create your online store, when you do anything with your business. It is a word that you don’t need to have on signs because a customer should automatically feel it. If you want to own a word like luxury, then buying booth decorations at the Dollar Store might not be the best choice. If your word is something like peaceful then dressing in tie-dye would be a bad idea. If your word is organic then a website in neon green and purple isn’t appropriate. What I found with my three colleagues last weekend in every case the word that I felt in each booth was “chaos”. This is not a good feeling and it’s not a feeling that would make me stop as a customer. In each case they hadn’t yet defined the essence of what they did and so they threw in a little of everything not only in their work but in their display. As a customer strolling down an aisle, or cruising around online, it’s too much effort to dig around to see what you are really about when the person next door is giving me a nice clear message. Pick up your favourite pen and notebook. Start scribbling. Grab your thesaurus. Think. What is your word? With exquisite beads and jewelry of course! I'm one of those that got into beading and jewelry, not so much for the jewelry - but rather my love for beads. I don't need to do anything with my beads to make me happy - just possessing them is enough. I'm curious to know how many of you incorporate art beads into your jewelry? If so, does your selection define the piece? Do you work around a certain bead, or do you have a design in mind - and them try to find a bead that matches? Do you collect a certain artists creations? Yes, so many questions! I would love to hear your thoughts on what appeals to you, and why you buy/covet/collect them. Have you branched out into Vintaj metal yet? Well, why not? You could start with this metal branch! This week - following our recent trend of metal, metal, and more metal, we have some new Vintaj components for you. The Vintaj components have a wonderful sense of whimsy, and a very Art Nouveau influence. We've added some fibre options lately, Mousetail (smaller than our regular Rattail), Silk Ribbons, and Wire Lace - which - I dunno. It's knitted out of wire, but the technique for making it is like making fabric, so is it Wire? or Lace? Anyway - what you are probably looking for at this point are some ribbon ends or connectors. Well, in the spirit of Murphy, this is the point at which our supplier decided to cease production of the standard, classic, been-around-since-the-50's clamp-on ribbon-end. Don't it just figure? So, we've been scrambling around, looking for alternates. We do have some options for you. This wide, toothy end clamps on, with the teeth providing extra traction - but you know, a little extra insurance with a dab of glue couldn't hurt either. Comes in Nickel plated or Gold Plated. We also have these ends, for one or two cords, maybe three if they are small. These have a couple of holes in the side, so you could stitch through the hole with a thread or small wire for extra holding power, or it also gives a place for some glue to hang onto and dry out properly. We have these in Copper, Silver, Brass and Gold colour. More arrivals in the Topaz Blend or the Amethyst Blend! Best just to go to the Swarovski page and look for the new tags! Happy Hour Torching Expands to Two Nights!